Jedd Gyorko hit a two-run homer and Yangervis Solarte had four hits to lead the San Diego Padres to a 10-7 victory over the Los Angeles Dodgers on Thursday night in the opener of a four-game series. 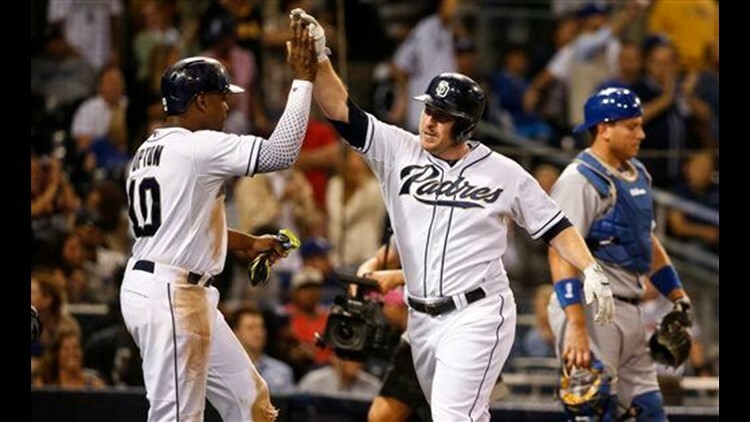 SAN DIEGO (AP) — Jedd Gyorko hit a two-run homer and Yangervis Solarte had four hits to lead the San Diego Padres to a 10-7 victory over the Los Angeles Dodgers on Thursday night in the opener of a four-game series. With San Diego trailing 7-6 entering the eighth inning, Jim Johnson (2-6) walked leadoff hitter Justin Upton before Gyorko followed with 11th homer. The win snapped a two-game skid for the Padres, and stopped the Dodgers' three-game winning streak. Kevin Quackenbush (3-2) pitched two scoreless innings to earn the victory. Joaquin Benoit retired the side in the ninth for his second save of the season. San Diego got off to an early lead by scoring two runs in each of the first two innings against Dodgers starter Mat Latos, who allowed four runs in four innings and has not won a game since being acquired by Los Angeles on July 30. Odrisamer Despaigne and Marc Rzepczynski allowed five runs in the sixth as the Dodgers built a 7-4 lead. Justin Upton scored in the sixth after being called safe at second by umpire Chris Conroy, who ruled that second baseman Chase Utley did not tag the bag with his foot on an attempted double play. The replay review upheld the call and Upton came home to score on a double by Derek Norris. Solarte hit a solo home run into the third deck of the Western Metal Supply Co. building in left field to pull San Diego within 7-6. Solarte had two doubles and a single. Matt Kemp drove in two runs against his former team. Kemp has reached base in a career-high 23 consecutive games. Corey Seager had two hits, drove in two runs, and scored twice in his major league debut for the Dodgers, who promoted Seager from Triple-A before the game. Padres: RHP Josh Johnson (elbow) is scheduled to pitch one inning for Single-A Lake Elsinore on Friday and another inning on Monday. IF/OF Wil Myers (wrist) will play another game on Friday in his rehab assignment with Lake Elsinore. Dodgers: Mike Bolsinger (5-3, 2.83) will make a spot start in the second game of the series in San Diego. It will be Bolsinger's 17th start of the season, and allow the rest of the rotation to get an extra day's rest. Padres: James Shields (10-6) takes the mound for San Diego, trying to stop the Padres' three-game skid. Shields tied his season-high by going seven innings in his last outing and allowed one run.